Hack on track: Max Gillespie's tradie track hack! When you work in the construction industry, finding the right work vehicle is important. It needs to be able to carry all your tools and equipment — a heavy load-rating helps — and fuel economy is definitely not going to go amiss. 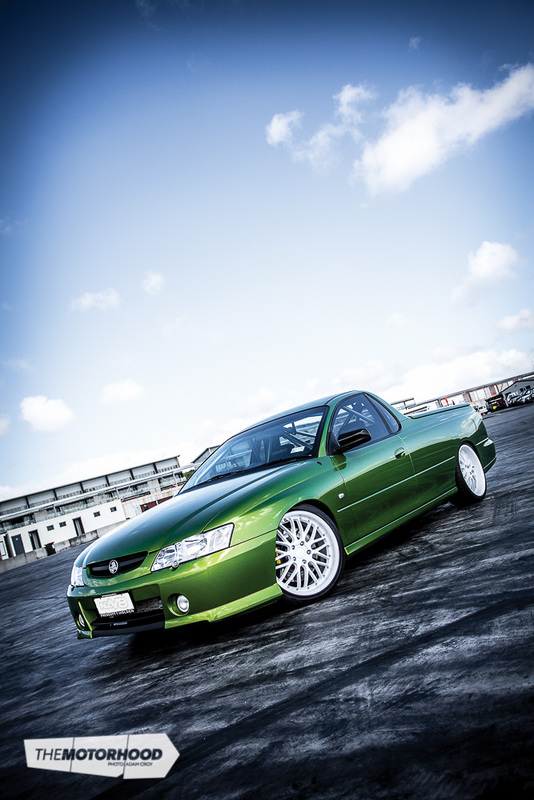 So, with that in mind, we’re not entirely sure how Max Gillespie ended up with an LS1-powered Commodore ute as his work hack, but that hardly matters when you see what 10 years of ownership has turned it into. Of course, the limits of the Commodore’s factory underpinnings soon became apparent. 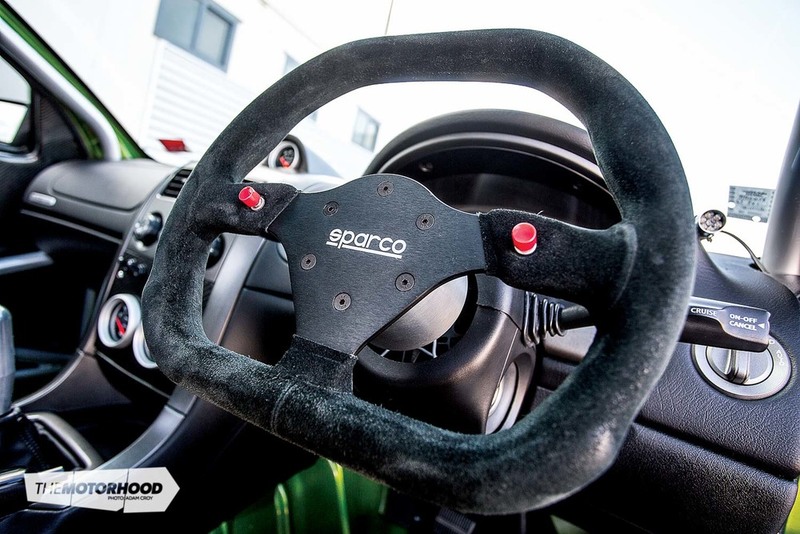 It was dragged back into the workshop for the modifications to continue — an Exedy twin-plate clutch, a Harrop short-shifter, and 3.9:1 diff gears sorted the driveline, but effective power delivery is only one ingredient in the recipe for a successful track car. To sort the handling package, Bilstein coilovers were installed up front, complemented with Koni adjustable rears, Nolathane bushes, and a beefy 30mm front sway bar. Huge AP Racing brakes found their way to each corner, and the semi-slick tyres Max uses for track duties ensure that power delivery, cornering, and stopping are all dealt with as efficiently as possible. A pair of Racetech 1000 fixed-back bucket seats were also installed — necessary to allow Max to make full use of the Commodore’s dramatically enhanced handling capabilities. Such enhancements immediately paid dividends, and, with tuition from Paul Manuell about lines and braking points, Max managed to cut his lap times around the old Pukekohe track layout down to 1min 6s. Max was pushing pretty hard but always stuck to his number-one rule — keep it off the wall! Such rapid lap times drew Max to make another decision, in the name of safety — the Commodore was going to need a roll cage. Expert fabricator Kerry Holland, at Top Gear Autotech, was contacted for this stage of the build. 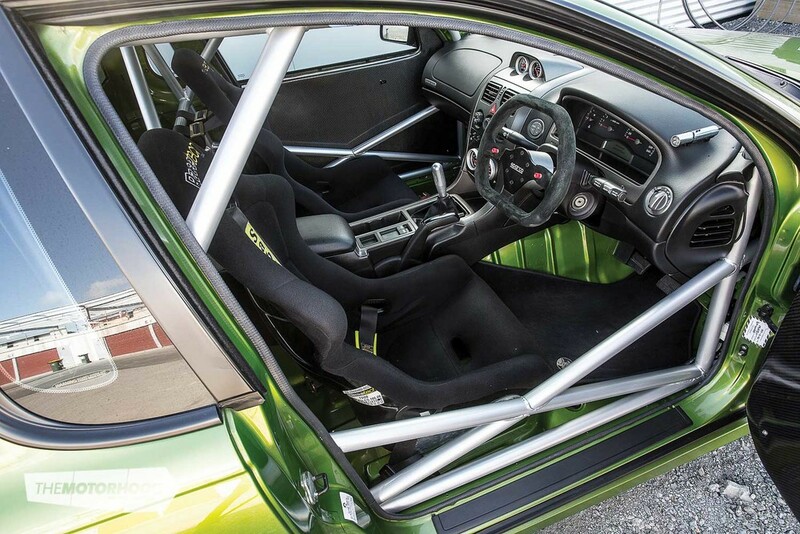 Max wanted a full eight-point roll cage, and that would mean having bars going through the rear window — despite Max having been told by a number of people not to do this, Kerry had no concerns about doing it. 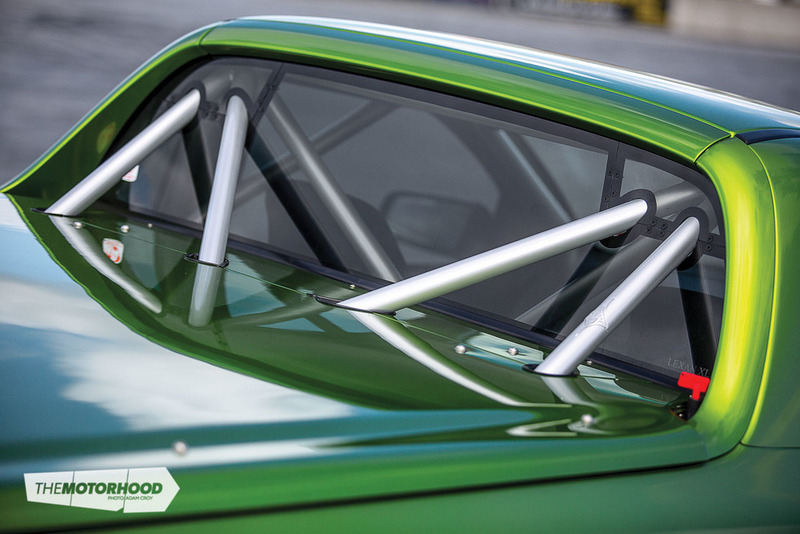 While he was at it, Kerry cut out the factory strut tops and welded in a set of adjustable camber plates, giving a degree of flexibility between street and track suspension set-ups. “I remember going down to Kerry’s workshop to check progress, and seeing the ute stripped with a cage being welded in — I just thought, What the f@#k am I doing? !” Max laughs. With each lot of work being performed on the ute, it was beginning to look more and more like a full-on race car. However, when it came to the interior, Max was determined for it to be nice, tidy, and — most importantly — subtle. His good mate Phil Otene is a panel beater by trade and gave Max a hand to sand and prep the stripped interior for painting. The Holden catalogue was raided for paint codes, and Phil sprayed the cage in Quicksilver and the rest of the interior in Hothouse Green. In pursuit of tidiness, the dashboard was reinstalled around the roll cage, and Max made up carbon-fibre panels to house the toggle switches, oil-pressure warning light, and Auto Meter gauges in the now-empty stereo slot. However, the roll cage also rendered the factory door cards unusable, so Max was left scratching his head at how he’d tidy the doors up. Luckily, Paul Manuell came to the rescue, sourcing a pair of genuine V8 Supercars carbon-fibre door cards. “They were perfect, but a real stress and mission to fit. The interior is still one of my favourite aspects of the car,” Max says. Once again ready to hit the track, Max had a lot of fun over the next year, taking the ute to Powercruise and track days and doing a bit of street driving. By this stage, though, the LS1 had taken a fair beating and was getting a little tired — plus, Max was beginning to feel the urge for more power. As if by chance, Max learned that Paul Manuell was looking to sell the LS7 from his V8 SuperTourer after the end of the race season. Max began doing his homework, comparing costs and power figures for the LS7 versus rebuilding and stroking the LS1 — as it turned out, the LS7 was a no-brainer. The biggest hurdle he’d need to overcome would be converting the LS7 to a wet-sump oiling system, to clear the Commodore subframe; a kit from Scoggin-Dickey Parts Center would take care of that. With this info in mind, Max decided to commit to the LS7 and paid a deposit for the engine — now began the nerve-racking wait, watching the V8 SuperTourers on TV and hoping the engine would still be in one piece by the end of it. LS7 had broken a valve-spring retainer, causing a bit of damage, and the engine would be subject to a full rebuild. The completely blueprinted rebuild included new rods and pistons, as well as line-bored cylinder bores and crankshaft mains. With that in mind, and the fact that the engine would be built by Royce McCort at Autospeed Engineering — the builder of Greg Murphy’s former V8 Supercars engine — Max once again committed to the LS7 and began gathering the parts and information he’d require to transplant the LS7 into the Commodore. Having the LS1 out of the engine bay allowed Max to tidy up what is typically the messiest area of any late-model car. Max again called on Kerry, who came out and seam-welded the chassis, strut towers, and wheel wells, as well as filling the holes that were left from the removal of the heater and air conditioning. This work was finished off with Max’s garage temporarily becoming a spray booth, so Phil could apply fresh coats of Hothouse Green to the improved engine bay. With the LS7 ready to go and a set of HPC-coated Di Filippo four-into-one headers yearning to make some noise, Max wasted no time in slotting the LS7 into the freshly detailed engine bay. Dion at Howick Auto Electrical was then tasked with sorting out the wiring side of things, including deleting and hiding as much of the wiring as possible. The result is amazing; the engine bay looks unbelievably clean for a late-model car. Unfortunately, around this time, Max broke his neck in a surfing accident, and the Commodore was forced to sit idle for six months while he recovered. With a lot of time off work during his convalescence, Max was soon back into it, polishing off all the little jobs needed to get the ute running. The installation of a Fast 102mm billet throttle body, Xair over-the-radiator cold-air intake, and Di Filippo 3½-inch stainless exhaust rendered the Commodore ready to hit the EAPC dyno. While Max was understandably nervous about the dyno tune, he needn’t have worried. The LS7 pumped out an incredible 400kW (536hp) at the rear wheels — close to 700hp at the flywheel — screaming to 6500rpm on each power run with ease, and easily wheelspinning on the dyno. Max’s first road test on the way home confirmed this, with the Commodore easily breaking traction in the first three gears. Since then, Max has had the ute out at Pukekohe Park Raceway a few times, with the LS7’s torque putting him to the test a couple of times. 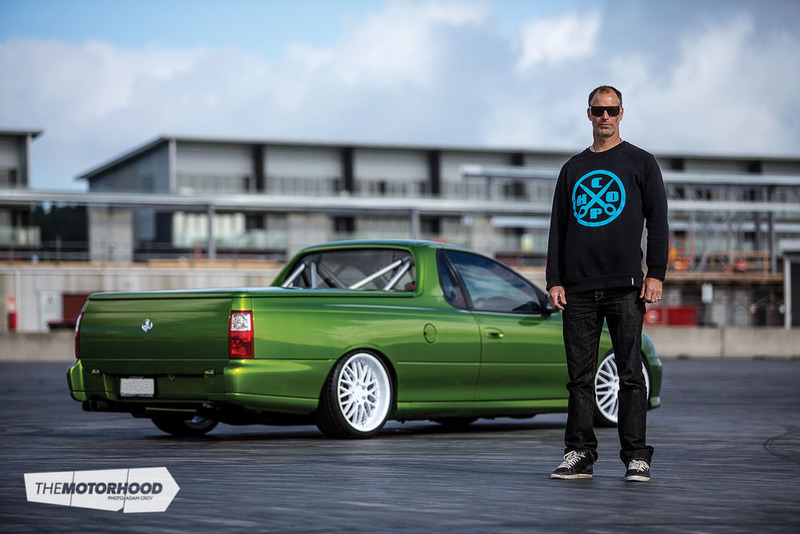 He’s also had the ute out on Hampton Downs, at events such as Powercruise and the Mothers Chrome Expression Session, where he won a trophy in the competition class. “These events are a lot of fun, being able to smoke the tyres at just a stab of the throttle. But most of the time, it flies under the radar — at a glance, it just looks like a ute with a set of rims, although it tends to pull a crowd if I leave the doors open and the bonnet up,” says Max. Surprisingly, future plans are pretty minor. All Max would really like to do is a bit more suspension work, to improve the geometry and gain adjustability. Other than that, he’s looking forward to enjoying the car however he can — and the fact that it has remained road legal means that he really can enjoy it whenever he wants. So, if you’re ever on the road and catch sight of a green Commodore ute carving up the street, don’t blink, as you might just miss it.